Looking for a fresh look? 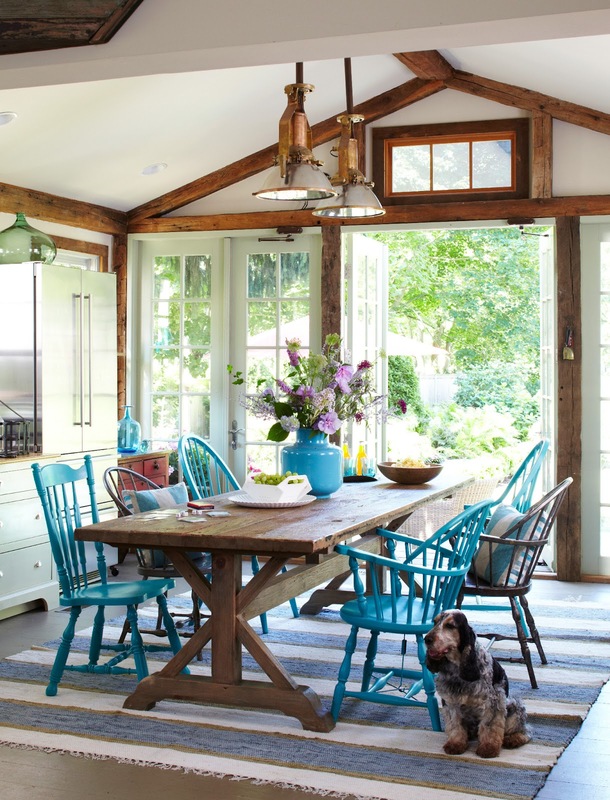 Color can be a major game-changer for your home. The photos below may appear familiar to you for they first appeared in the February issue of Better Homes and Gardens magazine. 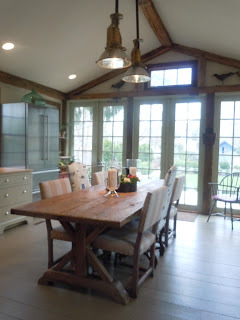 I produced and styled this feature along with Connecticut interior designer, Ann Rae. Ann applies color in unique ways. The blue color she used on her home's front door is an inviting and fun eye-catching element which suggests the extraordinary use of color to be found once inside her home! 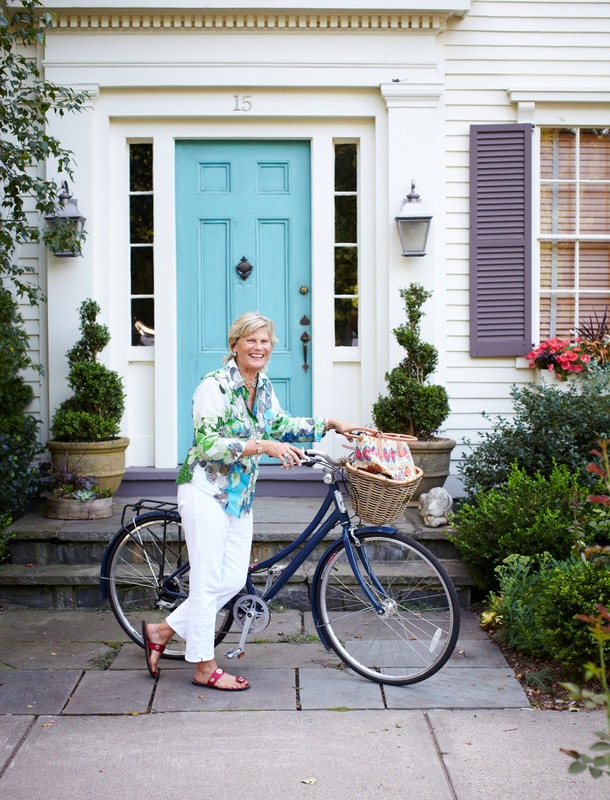 Interior Designer Ann Rae in front of her home in Connecticut. It was the door color above that inspired us to do something really fun to spice up Ann's kitchen. 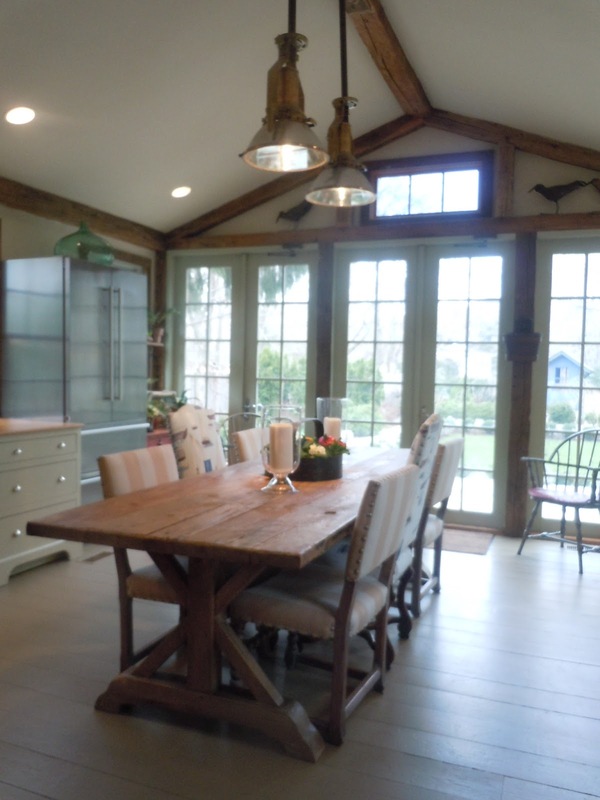 Although we loved Ann's kitchen before the shoot, the room lacked the color that Ann had used so creatively throughout her home. Inspired by Ann's color sense, we decided to rev up the color in the kitchen by bringing in new chairs for her fabulous table. 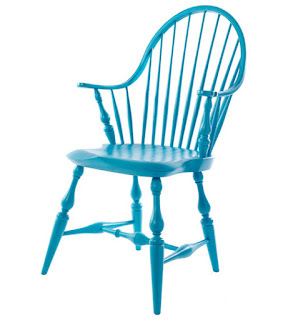 I shopped for 4 mismatched Windsor style chairs and found them at thrift, consignment and junk shops. The day before the photo-shoot my assistant, Monica and I went to work in Ann's garage to paint the chairs. I love the idea of mismatched chairs at a table. We added two of Ann's antique wooden Windsors into the mix. The strong blue color of her chairs are the unifying factor which makes it all work. Ann added the rug which visually anchors the table to the floor. I found the blue vase (above) at a local shop and then added a floral arrangement which we made from Ann's garden. Create a strong and colorful focal-point by adding a unique element such as the vase seen in the photo above. 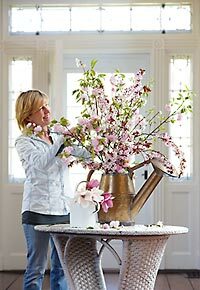 Change the appearance weekly with a different variety of fresh flowers. I absolutely adore this look ! Love your blog Karin! I must visit more often.....since hubby retired my online time is pretty much curtailed. Perhaps by my choice....have to think it over. I"m not using my time wisely......of course! lol. I love this Karin. I want that rug! Karin, I am learning so much from your blog!